Having been shot in the chest and left for dead, Detective Inspector Wagstaffe of the Force (that’s ‘Staffe’ to you and me) has taken his hunky self off to Almeria to lick his wounds in a remote villa in the heat of high summer. 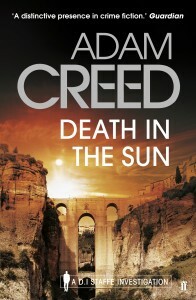 But as one might expect, whenever a fictional sleuth goes on his hols, there is trouble brewing in paradise. In this case, trouble comes in the form of a corpse in a polytunnel, artfully planted up to its waist and watered like a show leek. Staffe has chosen Almeria, on the south coast of Spain, because this is where his put-upon, hippyish sister Marie now lives with her precocious schoolboy son Harry and her dope-smoking wastrel of a beau. Inexplicably, our Staffe has also bonded with the irascible, violent, alcoholic Manolo – which conveniently gives him access to the seedier side of life, and a chance to chew over the political background of this region, where the divisions caused by the civil war still run deep, ETA (the Basque separatist organization) is still active, and there is a thriving Muslim community due to its historical conquest by nearby Morocco. Meanwhile, back in chilly old Blighty, a parallel story is playing out in which Janus Golding – the young addict Staffe befriended in a previous novel, and who shot him for his pains – is being pursued by Staffe’s old mucker D.I. Brandon. It turns out that the show leek method of murder (aka ‘the Caligula’) is one used by the Communists during the civil war. But the local plods seem reluctant to investigate – the corpse gets only a cursory examination, as does a second corpse, that of local journalist Gutierrez, whose car veers inexplicably into a ravine en route to a rendezvous with the notorious former ETA politico reputed to be responsible for the bombing that killed Staffe and Maria’s parents years earlier. Confused? But we’ve barely scratched the surface. I haven’t yet mentioned the impoverished (but is he?) expat American artist Jackson Roberts, friend of long-ago deceased famous painter Hugo Barrington (who ignited scandal by impregnating at least one local signorita), both of whom appear to have shared bodily secretions with mysterious multi-millionaire Astrid, who also happens to be the mother of the irascible Manolo (remember him? ), but who disappeared suddenly in mysterious circumstances (possibly to Morocco, possibly not – what do you think?). So it’s down to Staffe and sassy, high-heeled, local hackette Pepa to investigate. I have to say that the heart sinks when a book begins with a hand-drawn map pointing out notable landmarks, because this signifies the reader must Pay Attention to geographical details, which may prove germane to the plot. In this case they are unnecessary, but reflect the (I assume) fact that the book is set in an actual location, beloved by an author unable to resist liberally studding the text with Spanish phrases (kindly translated in an appendix) and nuggets of local knowledge. After a bamboozling beginning (too many plot lines, too much Spanish trivia, too little exposition), the novel eases into a trot – when Gutierrez’ car nosedives, when a hidden will is discovered, when valuable oil paintings are unearthed – until by the end it is fairly cantering along. From a style point of view, there is an interesting conflict being played out in this novel: that between the requirement for a decent whodunit to deliver a clear series of interesting clues; and the oft-stated requirement for the literary author to ‘show, don’t tell’. This conflict is wonderfully resolved by Rose Tremain in the grisly and delicious Trespass, and by the peerless Kate Atkinson in – well, any of her crime novels, but I especially recommend Started Early, Took the Dog. 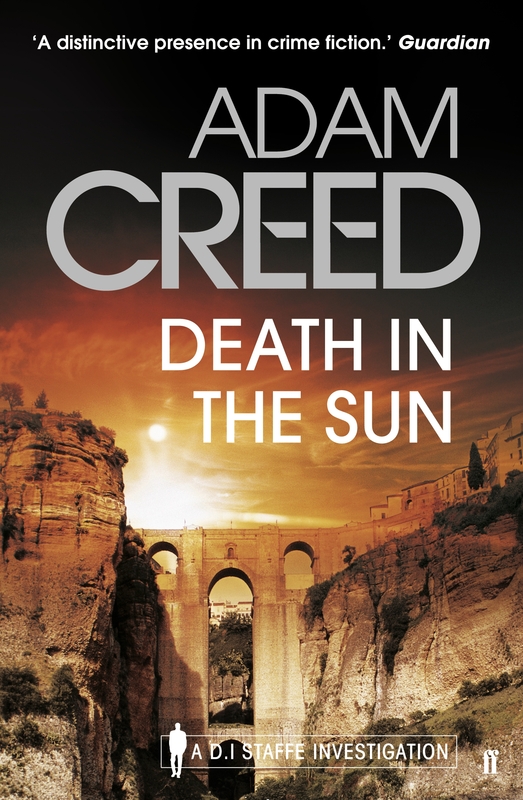 Adam Creed – a creative writing alumnus of Sheffield Hallam University, now Head of Writing at Liverpool John Moores – clearly has similar ambitions to marry literary prowess with pacy exposition. But it’s not until he unbuttons his literary collar and ditches the self-consciously oblique style that muddies the early chapters that the novel properly takes off.